The home improvement industry has grown considerably over the last several decades, as homeowners increasingly took steps to turn their homes into personal oases. But such projects often produce substantial amounts of waste, negatively impacting the environment as a result. * Choose recycled content building materials. 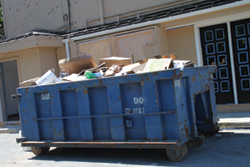 Another way to reduce home improvement project waste is to make use of other homeowners’ discarded materials. Recycled content building materials are products that include materials recycled from previous projects. These once-sparse materials are now commonplace, and labels often include the percentages of postconsumer and recovered materials used in each product. Materials such as drywall, insulation, kitchen countertops, glass tiles, carpeting and carpet padding may include recycled content, and the growing popularity of such products has made them relatively simple for homeowners to find. When working with contractors, homeowners should emphasize their desire to use materials made from recycled content. Such materials are both pleasing to the eye and the environment. Homeowners building new homes should expect to one day move, and ensuring their new homes are easily adaptable is both financially sound and eco-friendly. When a home is built with adaptability in mind, prospective buyers won’t have to make costly overhauls. In addition, homes built to facilitate future renovations won’t produce the same amount of waste as homes that are less easily adapted.